When I got up to use the bathroom at 6am I couldn’t walk properly. It took me until 8am to get my limbs moving well enough to go downstairs for breakfast. Between my legs and the back wheel I was having serious doubts about my prospects for the day. The first 18 miles went pretty well. The A82 was fairly busy, but mostly flat, which at this stage in proceedings counted for more than anything else. My legs were starting to warm up, but at first even the slightest upward gradient hurt like hell and reduced me to a snails pace. As I approached Ballanchulish I saw the road snaking up the mountain ahead of me. I felt sick. Then as I rounded the corner I couldn’t believe my luck. 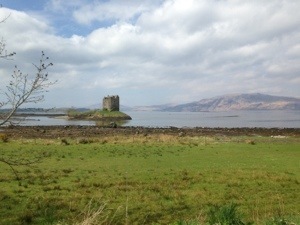 The road to Oban veered off to left and was marked with a brown tourist sign as the Argyll Coastal Route. Not only were the next 25 miles completely flat, but for most of the way there were cycle paths running alongside the route of the road. I think this was the first time I really enjoyed the ride, and it wasn’t until 5 miles from Oban that the hills kicked in, by which time my legs sufficiently broken in to cope. Oban is a Victorian seaside town, that reminded me a lot of Scarborough and Whitby. It was a good place to break for lunch as I wasn’t expecting the afternoon to be so flat and would need to calories. The long steep pull out of Oban had my legs battling with my stomach for blood supply, before eventually giving way to open moorland and then a long swooping downhill. This was a pattern I would be forced to repeat about a dozen times over the next 35 miles. It was beautiful, but physically demanding in the afternoon heat, and with frequent breaks it took me 4 and a half hours to reach Lochgilphead where I enjoyed a well earned ice-cream in the sun at the waters edge. 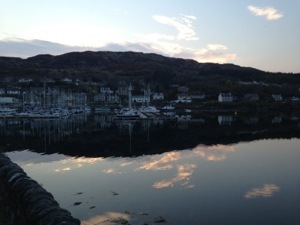 The final section was 15 miles of coast road to Tarbert. It was cool, shaded and lovely apart from the monster hill 2 miles from the end. Why would I expect anything else now? Despite some seriously weary limbs, as I tucked into a feast of seafood and a couple of craft ales overlooking the fishing boats unloading their catch in the harbour things didn’t seem too bad at all.